I was spurred on to start this project by the global epidemic of food waste — as much as 50% of all food grown worldwide gets wasted before and after it reaches the consumer. Most of the food waste in the UK is avoidable — it could have been eaten had it been better managed. 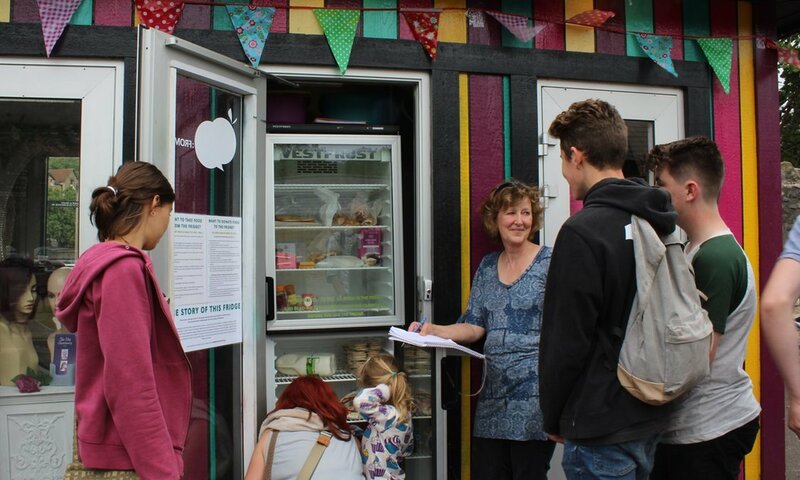 The Community Fridge: Frome is a simple solution that is replicable across all communities, enabling anyone to share some of this surplus food while cutting costs and emissions. The initial seeds were planted in our ‘Challenge Brief’ by Anna Francis, resilience officer at Frome Town Council who had seen the idea in a Guardian article on ‘Solidarity Fridges’. So over two months of pop-up events and feasts the idea grew: What would happen if we replaced our trash bins and shared our food surplus? After mulling over the challenge phase of Edventure:Frome I wrote a proposal to Frome Town Council to set up the UK’s first Community Fridge. A controversial idea — a fridge in a colourful disused toilet block in a small town to share unwanted food. Fromes IfF (Independence for Frome) Councillors, eager to support innovative grassroots ideas, said YES! And so the first Community Fridge in the UK, in our little town of Frome, was born. 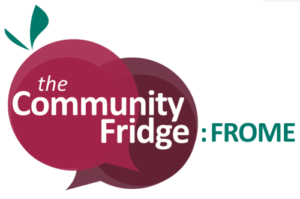 Community Fridge: Frome is a product of the collaboration of many groups, organisations and volunteers. A vast amount of work in the dark; public liability insurance, health and hygiene, angle grinders and spray paint, the radio and TV shone their light in our direction. We launched with a bang: international BBC news, radio and newspapers. The fridge now proudly wears a five star health and hygiene rating and has saved around 5,000 food items in the four months since we launched. We continue to call all businesses and individuals to be more waste aware. 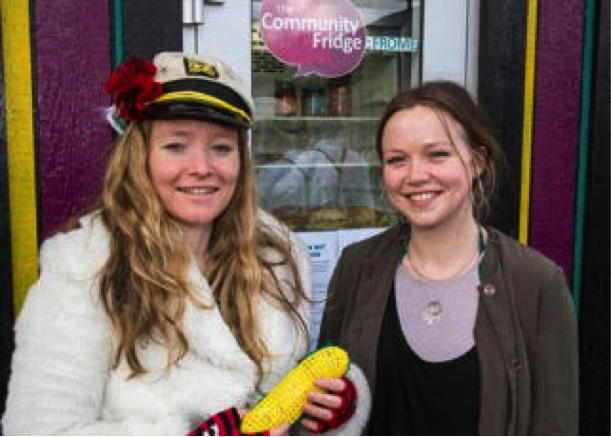 Esther Deeks and Anna Francis, resilience officer of Frome Town Council, celebrate the launch of the Frome Community Fridge. The rule of thumb is simple: Anyone can drop off good but unwanted food, and anyone can help themselves to what is on the shelf. For some of the community members in Frome, the first time they eat is at the evening drop-offs after businesses close and the fridge is booming. For others it is a welcoming space for their gluts in rhubarb from their allotment. The secular nature of donators and collectors has allowed the fridge to spark new community and connections in Frome. Our fridge is open 8 am – 8 pm and accepts any kind of vegetables, bread, sandwiches and alike, all within their use by date. To avoid any issues with food hygiene, the Community Fridge: Frome does not allow raw meat, fish or eggs. Home cooked food will not be accepted, only food prepared and cooked in a certified kitchen. To support you in starting your own, I created a Community Fridge Resource Pack throughout the launch of the project, full to the brim with tips and information. It is available on a donation basis HERE. Let’s utilise our food and fight against waste! Let’s recover the time and energy that went into producing that food, and enjoy it! You could also get involved with the initiative by giving your time and volunteering with your own local community or ‘solidarity’ fridge — more are popping up and the idea is growing, so keep your eyes peeled and taste buds at the ready. More information, visit our website. You can also like our Facebook page HERE or follow them on Twitter HERE. Esther Deeks started the UK’s first Community Fridge in the Spring of 2016 with Edventure: Frome and the Frome Town Council. Throughout this project she has been filming with Jamie Oliver and Jimmy for part of a series on food waste to launch next year. She is passionate about food from field to fork and loves exploring new projects that are opposing the 'norms' from organic market gardens to restaurants. She is currently volunteering at The Calais Woodyard, processing, chopping and distributing wood in the Calais Refugee Camp. In the lead up to the proposed eviction of the 10,000 refugees there she is hoping to collaborate on a project to show that migration is an amazing thing and is welcomed by many. Esther, congrats on this inspiring initiative. You know, many offices already have refrigerators. But the ‘rules’ are that the food ‘belongs to’ someone. Why not change the rules, or at least repurpose a shelf as a ‘sharing shelf’ with contents free for anyone to help themselves to. Do any readers already do this in their office? Jacquie, I worked at an office where they had a ‘sharing shelf’. Checking to see what people added each day became a conversation piece in the office. It actually gave people something to look forward to. I think this is a great solution to waste in offices. Love hearing about that sharing shelf. A whole new way to bring a community together (as well as deal with waste). I always feel good personally knowing that my still usable stuff will get into hands that appreciate it. -J.O. This is a beautiful project that should totally be replicated in the world! Talking food waste is such a large issue that plagues many of our cities and towns. Love the innovative solution, congrats. Nice job, Esther! And thank you for the document with tips on starting our own– I was always curious about the ins and outs. Esther, this is such an exciting initiative! I am hoping to implement something similar in a college dorm by making a “share” box where you can exchange snacks with others. Does most of the food in the fridge get consumed? Or would there be a way to “save” food that is about to go to waste by freezing or cooking it? Glad to hear that this project was so well received! I believe I’ve heard that a similar program is starting on NYU’s campus in Brooklyn. Exciting to see this idea is spreading to NYC. These programs seem to be popping up across the world from California to Colombia and Germany. But, as I was reading a number of articles about programs similar to the Edventure: Frome, I noticed that most of the leaders of the movement highlight that this is not “charity.” My question is: why can’t it be? As a lifelong New Yorker, I feel like I see homelessness everywhere and an idea that’s not reaching its full potential. Why can’t this be a solution for two issues in society? Here’s my idea: the director of the program could partner with an organization, like the Doe Fund for example, which helps homeless men and women reintegrate themselves into society. A representative from the organization would come periodically, and on that, day the produce would only be available to homeless men and women. Then, even though the homeless person would be receiving a meal, they would also be connected to people who can help them get back on their feet and provide for themselves. There could be a limit as to how much each person is allowed to take so things don’t get too hectic. Any thoughts? I’m sure there are probably potential issues with this plan that I simply have not thought about. If anyone is interested, we can discuss outreach methods, as well! As a New Yorker myself, I was thinking the same thing. I actually thought this initiative was intended to serve as a charity and help out homeless folks. I always associated the idea of food waste being used to service people that are starving or don’t have the means of acquiring their own food. The whole idea in general is super awesome because it creatively tackles the food waste issue, but at the same time, if you have enough food that you generate leftover food, should you still partake in other people’s food waste when there are others that have nothing? There are definitely a lot of logistical factors that would have to be sorted through, but nevertheless I think it’s a really neat idea. This is a boundless notion and an idea that can undoubtedly reduce the wasting of food. It is exciting to see how well this idea worked and the concepts that went into developing it. This is just another way of building a community and sponsoring sustainability. Building and fostering a community is an important part of improving sustainability. If every city embraced this idea and put a least one refrigerator in, the amount of food not wasted would be fascinating to track. I certainly enjoyed reading this article and would love to drive this concept in my community. The idea of the Frome Community Fridge is something that completely embodies both environmental and economic sustainability. The innovators of the project recognized two major problems, food insecurity and excess waste, and inherently linked them together. So many environmental problems are also social problems, and to fix one is to fix the other. Unfortunately, my college campus is located in an area where poverty and food insecurity are on the rise. Many local children go to school without lunch or with something lacking nutritional value. If a community fridge were to be established in the local primary and secondary schools, children would come to school feeling more secure and confident in themselves. Eventually, this security would translate into better academic performance and self-sustainability. This idea could change the lives of children living in impoverished communities. This concept has me thinking about food waste in grocery stores. How much produce is wasted due to blemishes while still being good to eat? Is there opportunity with these types of business to take the “Community Fridge” idea and give the unsellable fruits and vegetables to the needy? I know food banks pick up donations, but that is often infrequent. The business itself can create avenues for donation or “tasting”. Both the article and your comment on food waste in grocery stores makes me think of the huge amount of food waste in our agricultural system. Like you said, any food that has blemishes or does not look “normal” is often tossed away or left to rot. It would be a great initiative for someone to go around to these larger farms and collect the so called “damaged” items but it seems like an impossibility because these farms would want to keep any potential profit for themselves. In fact, it seems like we need to change our whole culture and societal perception of food if we are to really curb the food waste at the macro level. We should be teaching people that food past the expiration date doesn’t mean it is spoiled, that distorted or misshaped fruit is still the same, and more. Overall, we have a societal problem that drives us towards wasting food because it is easy and cheap to do so. This reminds me of the program my high school’s cafeteria created. Everyday we had a large amount of leftover food after lunch was served to the students. At the end of the day, all of our leftover food was sent to the local food bank and then distributed to homeless shelters and families in need. I hope to see similar ideas soon in New York! This is a fantastic idea for not only food waste management, but also helping homeless and under-served people. I really would love to see this system happening in the city. I would love to participate and volunteer to make it happen!!! Wow Miss Deeks, what a beautiful blueberry-like genius you are. This should be rolled out all over the shop.